Vanilla ice cream in the waffle cup. 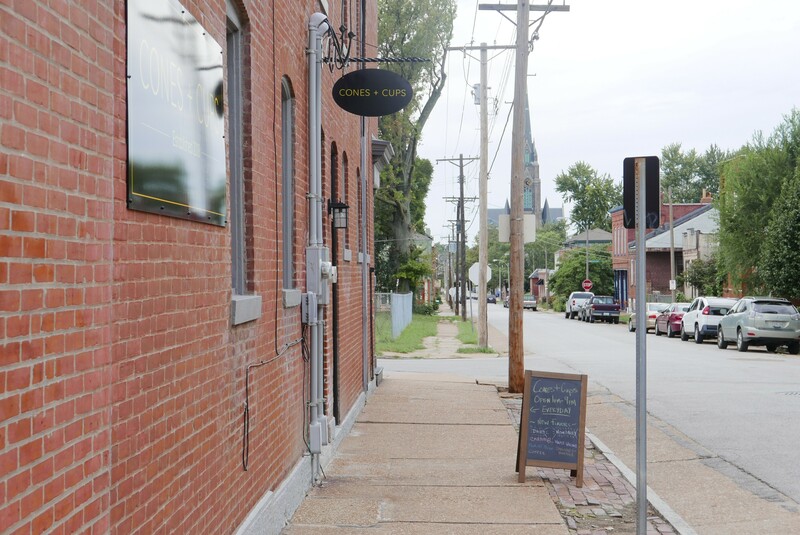 Ice cream shop Cones + Cups (2800 McNair Avenue, 314-899-0052) is the newest addition to the Benton Park food scene. Modern design inside is coupled with a pretty fenced-in patio outside, allowing customers to enjoy the nice weather right next to Fremont Park. The brick building has that classic old brick outside, but looks sleek and new once you step in. The white brick walls and dark wooden tables only add to the feeling that this isn’t your grandmother’s ice cream parlor — which is ironic because owner Diane Lindsay is herself a grandmother. 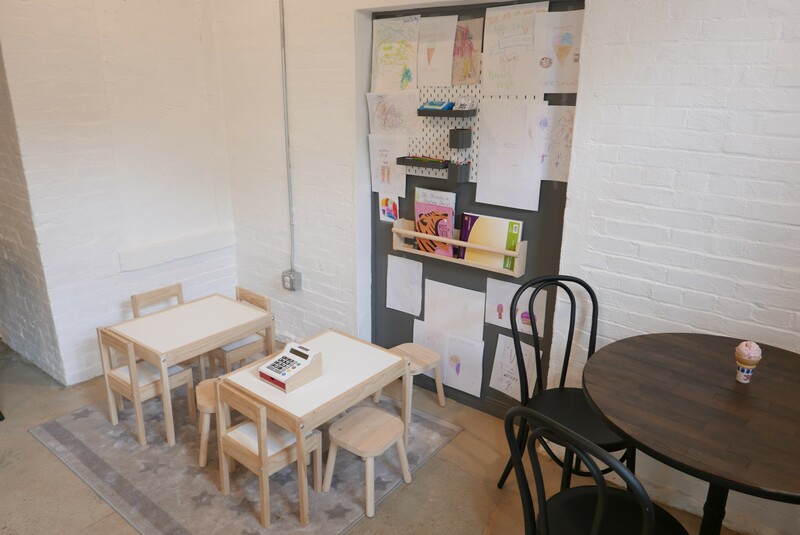 Two children’s tables sit close to the concrete floor, filled with toys and books to keep kids occupied while their parents can devour their own treat. 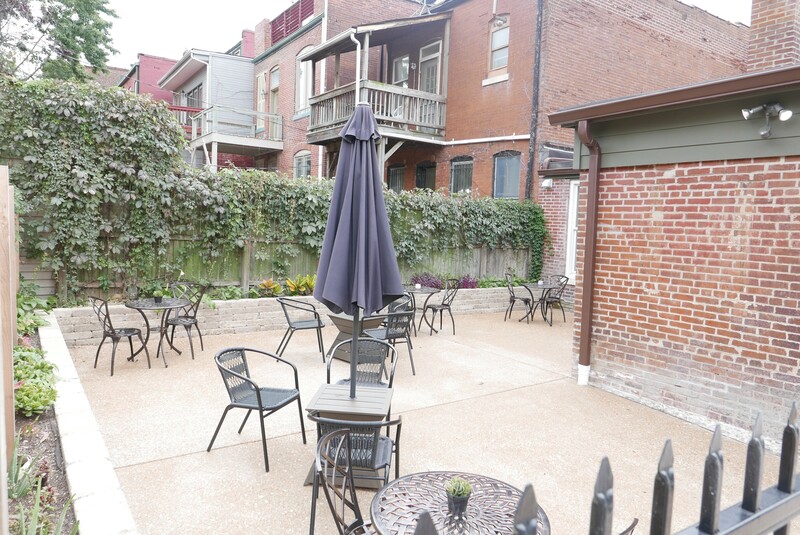 The outdoor patio is the perfect spot to sit and relax for a moment when the weather is just right. It sits behind a fence, away from the sidewalk and road, adding to the sense of escape that comes with each bite of ice cream. The patio is a great spot to enjoy your dessert. Lindsay says she has owned the building for fifteen years, mostly leasing it out, but thought she could do something with it after she retired. She says, "We decided we should fix up the building and do something that would fit in with our neighborhood." Cones + Cups makes all of its ice cream in-house. Lindsay says she originally looked into buying from a supplier, but ultimately opted against it. “Making it here on site, we're really flexible, we can just make it as needed, we can make flavors that people want and we can turn that over pretty quickly and be more responsive," she explains. 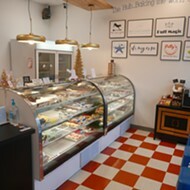 In addition to standards including vanilla and strawberry, Cones + Cups also offers several non-dairy ice cream options, an idea that started with Lindsay’s grandson, who is vegan. As she asked people what they wanted in an ice cream shop, non-dairy options kept coming up. So far, Lindsay says, those who can’t or won’t eat dairy have been grateful for the large number of options. 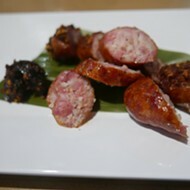 In fact, one of the house favorites seems to be the non-dairy "Nutter Butter." 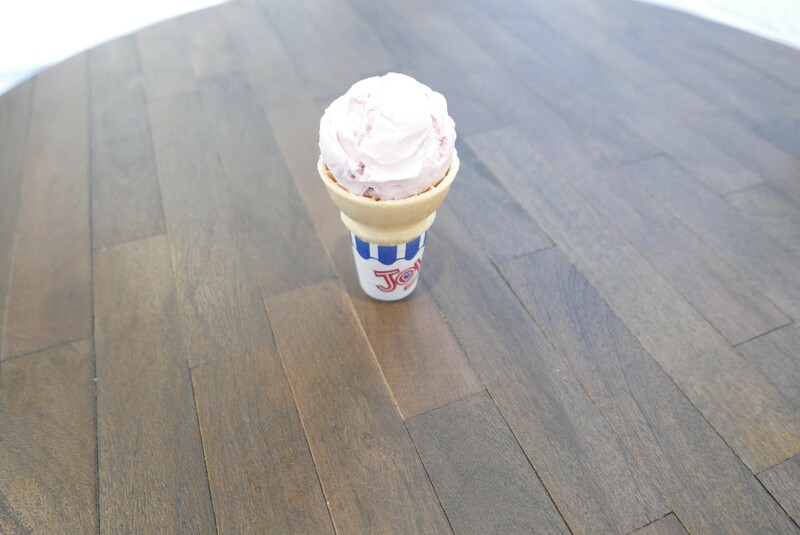 Strawberry ice cream in a sugar cone. Cones + Cups offers a dozen or so flavors, which you can get a number of ways. There are sugar cones, waffle cones, waffle cups, milkshakes, malts and even floats. 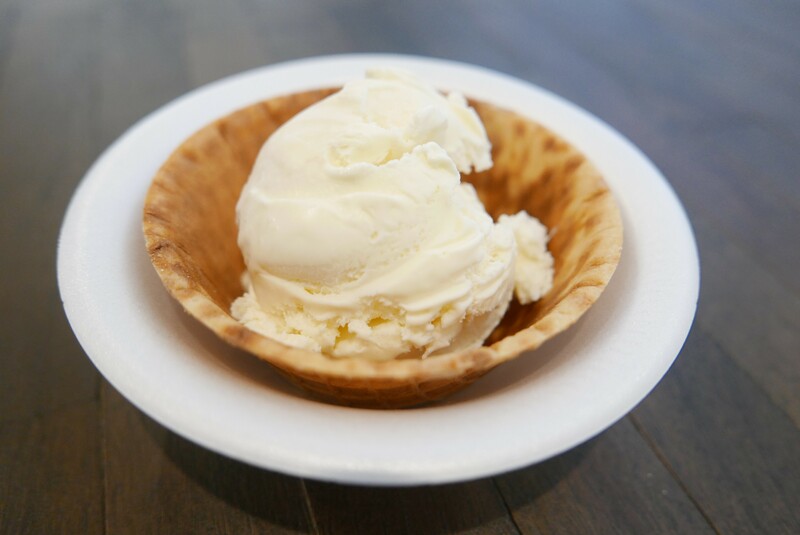 A regular-sized ice cream scoop is $3, and adding a cone or waffle bowl will cost an additional 25 to 75 cents. Several other dessert options on display include cookies and brownies. Hot and iced coffee and tea are also on offer. On Sunday, September 30, the shop will celebrate its grand opening with a “fall celebration” to thank the neighborhood for a great start. There will be fun photo opportunities and some fall-themed ice cream flavors to try as well. Cones + Cups is open seven days a week from 1 to 9 p.m. Scroll down for more photos. 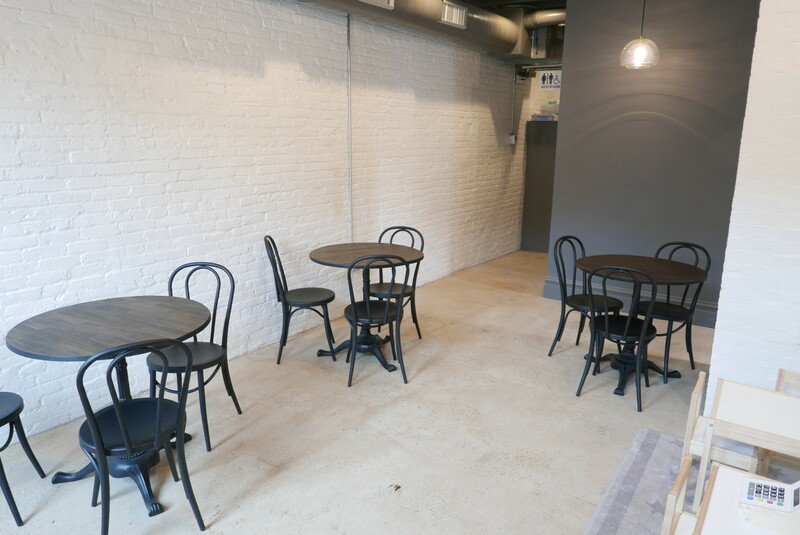 The inside seating area has several tables allowing you to take a moment to enjoy. A small children's area will keep kids of all ages occupied. The exterior feels old and classic while the inside feels sleek and modern.